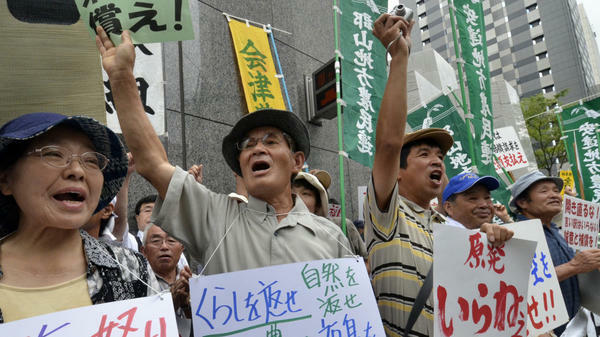 Farmers whose crops were ruined by a nuclear accident protest Aug. 3 at the Tokyo Electric Power Co. Many Japanese are calling for the country to lessen its dependence on nuclear power following the accident six months ago. United Nations Secretary General Ban Ki-moon (right) receives an Aug. 8 tour around a devastated area in northern Japan. The nuclear accident linked to the tsunami has turned many Japanese against nuclear power. Japan faces a dilemma: The country lacks natural resources and relies heavily on nuclear power. But in the wake of a nuclear accident in March, 70 percent of Japanese now say they want to phase out atomic energy. It's a huge, long-term challenge. Even backers of renewable energy say it could take two generations for Japan to become nuclear-free. 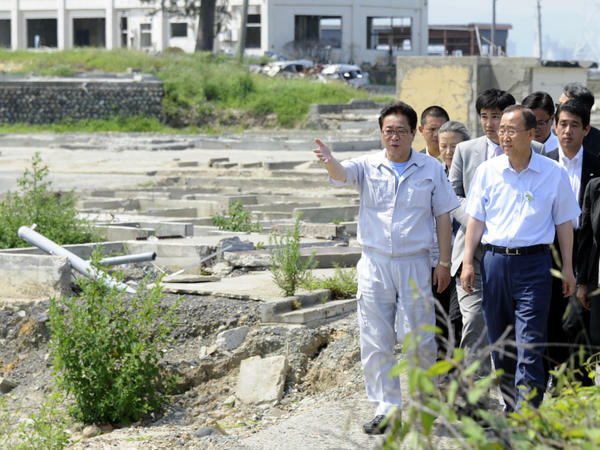 But Japan was taking action even before the accident at the Fukushima power plant on the country's northeast coast. Japan's newest mega-solar project opened last month in the Tokyo suburb of Kawasaki City. Nearly 38,000 solar panels are spread across land the size of several football fields, and they can power more than 2,000 homes. Tomomi Hasegawa, who works for the local environmental department, says solar energy has some big attractions in the age of climate change and nuclear fear. "There are no exposed power lines, so it's very safe," he says. "It doesn't pollute or emit anything, so there's no pollution either." But there are limitations. In clear weather, the panels can generate up to 7,000 kilowatts a day. However, on a not-so-sunny day, efficiency is lower, at about 3,000 kilowatts. And the panels take up space, a precious commodity in this crowded, mountainous archipelago. Kawasaki City is so dense, the government had to squeeze the project onto an industrial waste site between the airport and Tokyo Bay. Last month, Japan's legislature passed a bill to subsidize wind and solar power. The measure requires power companies to buy solar and wind energy at inflated prices. The idea is to make it worthwhile for companies to invest in expensive technology and speed up Japan's shift toward renewable energy. Kono Taro, a member of Parliament in the opposition Liberal Democratic Party, says the strategy is to let nuclear power slowly die off. "People generally agree we should not add any more nuclear reactors," Taro says. "And any nuclear reactor that has been operated for 40 years should be decommissioned. Then, by 2050, our nuclear power will be zero." If that happens, it would be a stunning turnaround. Nuclear power now accounts for at least 25 percent of Japan's energy. Solar and wind power makes up just 1 percent. Taro knows renewable energy has problems, but he sees ways around them. Not enough land? Put more solar panels on rooftops, Taro says. "We are surrounded by the ocean, so we could do a lot of offshore wind power," Taro adds. Taro also notes that one of Japan's most powerful businessmen, Masayoshi Son of cellphone giant Softbank, has a novel idea for using farmland damaged by the tsunami in March. "There are lots of rice fields where the seawater has covered and it's not fit to grow rice for some time," Taro says. "He wanted to rent it out and put mega-solar on top of it." Taro says public opposition to atomic energy won't fade away. For one thing, the power plant in Fukushima prefecture is still leaking radiation and remains a cause of concern. "Is it safe to eat rice? Is it safe to eat beef? That's what all of the mothers have been asking these days – even my wife, so people will not forget so easily," he says. Japan's powerful nuclear energy industry is betting that the public will forget, and that fear will give way to economic realism. "Almost all energies are imported from abroad: oil, natural gas, coal, even uranium," says Masakazu Toyoda, who runs the Institute of Energy Economics, a think tank. Toyoda says reducing nuclear power in the near term will force the country to import more energy from overseas. He says that will drive up costs and hurt Japan's exporters, which are already taking a beating because of the high value of the yen. "If we cannot provide sufficient energy at reasonable cost, the manufacturing industry will relocate factories from Japan to abroad," he says. Companies in the developed world often make this sort of threat, though not everyone buys it. But Toyoda says years of heightened energy costs could do real damage to an economy that's been stuck in the doldrums for most of the past two decades. "We would face the degrading of our living standard and we would lose our jobs," he says. "That is not something the Japanese people would like to see." Toyoda thinks the new law will boost solar and wind power dramatically, but not enough to replace nuclear energy. From NPR News, this is ALL THINGS CONSIDERED. But as NPR's Frank Langfitt reports from Tokyo, it will be a difficult transition for a country with almost no natural resources. And even backers of renewable energy say it could take generations for Japan to become nuclear-free. FRANK LANGFITT: Tomomi Hasegawa works for the local environmental department. He says solar energy has some big attractions in the age of climate change and nuclear fear. TOMOMI HASEGAWA: (Through Translator) As for safety, as you can see, there are no exposed power lines, so it's very safe. It doesn't emit anything, so there's no pollution either. LANGFITT: But there are limitations. In clear weather, the panels can generate up to 7,000 kilowatts a day. HASEGAWA: (Through Translator) Today isn't sunny, so the efficiency will be lower, around 3,000 kilowatts. LANGFITT: And the panels take up space, a precious commodity in this crowded, mountainous archipelago. LANGFITT: Kono Taro is a member of parliament in the opposition Liberal Democratic Party. He says the strategy is to let nuclear power slowly die off. KONO TARO: People generally agree that we should not add any more nuclear reactor and any nuclear reactor that has been operated for 40 years should be decommissioned. Then, by 2050, our nuclear power will be zero. LANGFITT: Taro knows renewable energy has problems, but he sees ways around them. Not enough land? Put more solar panels on rooftops, he says. TARO: We are surrounded by the ocean, so we could do a lot of offshore wind power. LANGFITT: And, Taro says, one of Japan's most powerful businessmen - Masayoshi Son of cell phone giant Softbank - has a novel idea for using farmland damaged by the tsunami. TARO: There's lots of rice fields where the seawater has covered and not fit to grow rice for some time. He wanted to rent it out and put mega solar on top of it. LANGFITT: Taro says opposition to atomic energy won't fade away. For one thing, the power plant in Fukushima Prefecture is still leaking radiation and worrying people. TARO: Is it safe to eat rice? Is it safe to eat beef? That's what all the mothers been asking these days - even my wife. So people will not forget so easily. LANGFITT: Japan's powerful nuclear energy industry is betting they will and that fear will give way to economic realism in this resource-poor country. MASAKAZU TOYODA: Almost all energies are imported from abroad: oil, natural gas, coal, even uranium. LANGFITT: Masakazu Toyoda runs the Institute of Energy Economics, an energy industry think tank. Toyoda says reducing nuclear power in the near term will force the country to import more energy from overseas. He says that will drive up costs and hurt Japan's exporters, which are already taking a beating because of the high value of the yen. TOYODA: If we cannot provide sufficient energy at reasonable cost, manufacturing industry will relocate their factory from Japan to abroad. LANGFITT: Companies in the developed world make this sort of threat all the time, and not everyone buys it. But Toyoda says years of heightened energy costs could do real damage to an economy that's been stuck in the doldrums for most of the past two decades. TOYODA: We would face degrading of our living standard and we would lose our job. That is not what the Japanese people would like to see. LANGFITT: Frank Langfitt, NPR News, Tokyo. Transcript provided by NPR, Copyright NPR.